The results of the 2010 Shark Week Video challenge are too adorable to not include in my review, and I note that someone who found out about the challenge from Southern Fried Science was included! Ultimate Air Jaws is the latest in a series chronicling the breaching behavior of Great Whites in South Africa. This premiere had some amazing photography, and though it focused on one of the few species that eats humans, it had no fearmongering whatsoever. In fact, it mentions that white shark attacks are extremely rare and that white sharks are usually “nonaggressive and show little threat to humans”. Chris Fallows’ awe of the sharks is evident throughout, and he often screams things like “incredible”. While no scientist is interviewed in this premiere, there is a solid natural history background on great white feeding and mating behavior. Clearly a scientist was consulted, and the photographers and divers are lay experts in shark behavior and ecology. Into the Shark Bite chronicled photographer Andy Casagrande’s (of Great White Shark song fame) quest to film the insides of sharks mouths using specially designed cameras. Though the premiere referred to this as a “feeding frenzy of science”, I’m a little skeptical about the value of this information beyond it’s “gee-whiz” factor. There was a little bit of fearmongering in this, but it wasn’t overpowering. Quotes likes “they’re big, they’re hungry…and they are seriously scary”, “you can see why you don’t want to be on the wrong end of those teeth”, and “what you can’t see can bite” are certainly not as bad as some of the quotes from last year’s premieres. Into the Shark Bite also had some scientific mistakes (though a scientist was interviewed at one point). When referencing “5 of the deadliest shark species in South Africa”, a ragged-tooth (also known as a sand tiger or grey nurse) was mentioned. These sharks are incredibly slow-moving and docile and are only known to attack humans in self-defense. I’ll give you top 100 deadliest sharks, but top 5? At one point, the narrator referenced a “pack” of blacktips. I wasn’t aware that sharks traveled in packs. Finally, while this isn’t a scientific mistake, trying to attach a camera to a shark by swimming next to it is arguably the dumbest things I’ve seen a person do. Shark Attack Survival Guide was definitely the worst of the bunch. It focused on a Chris Meloni lookalike who tries to recreate dangerous situations to show people how to get out of them. It was about as ridiculous as it sounds from the previous sentence.In one sequence, he blows up a boat to show what to do if your boat explodes and you are flung into the water with sharks that were previously attracted to your boat by absurd quantities of chum. That happens to me all the time, and I’m glad that I know what to do now. Seriously, though, proper boat maintenance will greatly reduce the chances of your boat exploding. The show almost took a positive turn when bizarro-Meloni said that “out of hundreds of species of sharks, only 20 have been documented attacking humans”… but a few words later he said that people should “consider any shark over a meter long to be potentially dangerous”. In another scene, he dragged a hooked shark into shallow water and then claimed that we should be careful because sharks sometimes come into shallow water. My mom said that the whole show reminded her of a combination of Jackass and the South Park parody of Steve Irwin (a la “I’m going to poke this crocodile and see how pissed off it gets”). Day of the Shark 3 was the latest in a series focusing on attack re-enactments and interviews with recent shark attack victims. Though it featured an overly dramatic logo that included blood in the ocean as a fin swam by and was entirely about sharks biting people, it wasn’t that bad. One of the victims later went on to do a shark dive to get over his fear. Another said “I look on the shark as my friend, not my enemy. He didn’t know I was a person, he thought I was a fish to eat”. Another would “love to learn more about sharks and what they do in the ocean… you can’t blame the shark, you were in his territory”. There were some issues with scientific inaccuracy. The biggest dealt with the notion of a shark coming back for a second bite after it let go the first time. This almost never happens, which WAS STATED IN THE DOCUMENTARY by National Aquarium shark expert Andy Dehart, but they still mentioned it several times. Most shark bites are “hit and run”, which means that once the shark realizes that we aren’t food, they leave us alone and don’t come back. Another time, Andy Dehart said that “bumping” is a shark saying “get out of my territory”, which is just not correct (shark’s taste buds are on their snouts, bumping is tasting). The narrator referenced bull sharks as the most common shark species in the Gulf of Mexico, which is just preposterous. The show also referenced the lateral line system as being “like a sixth sense”. It’s not like a sixth sense, it is exactly a sixth sense. However, this premiere had a lot of conservation focus. It mentions how sharks have few young and grow slowly, and it mentions how the Gulf oil spill negatively impacts shark pupping grounds. Shark bite beach covers a 2008 string of fatal attacks along the Pacific coast of the United States and Mexico. It focuses on interviews with the victims, but also includes community responses. Strangely, it also had some of the best conservation message of any Shark Week premiere I’ve seen- from the opening sequence where the narrator says “this time, the ultimate victims may be the sharks themselves” to a rare interview with a shark conservation NGO representative. Throughout this premiere, they acknowledge that shark attacks are extremely rare. They criticize local media for “spreading a full scale shark scare”. They strongly condemn a “shark slaughter” by Mexican fishermen in response to an attack. They point out the ecological importance of sharks as apex predators in great detail. There were some issues with scientific inaccuracy, though shark attack guru Dr. George Burgess was interviewed. Again we see this incorrect meme of people believing that the shark will come around for a second bite. The narrator refers to “100 million years of evolution”. Despite this, Shark Bite Beach was the best shark attack special I’ve seen. If we’re going to continue running these (and I’d be thrilled if we did not), this is a good model to use. Shark Bites was absolutely wonderful. If you haven’t seen it, it is available online (at least at the time of this posting). Watch it. It focuses on comedian Craig Ferguson overcoming his fear of sharks by learning about them and eventually swimming with them. His narration and inner monologue are hysterical. He mocks a honeymooning couple by claiming that what he is about to do is the real adventure. He refers to Survivorman Les Shroud as an “adorable crazy idiot”. He compared a fossilized shark tooth to Larry King by pointing out that both are still sharp after two million years. As the moment where Craig was to feed a shark approached, the humor got even better. He said “we’re getting ready to feed large wild predators. I know that seems stupid, but that’s only because it is.” He attempts to appear “less snacky”, and points out that “sharks are large meat eating predators and I’m large meat”. He fears an amputating bite and tells us that “I like my legs. Both of them. I’m a dancer”. After interacting with the sharks, his attitude completely changed. Happy island music (not scary over-dramatic music) was playing as the screen showed his first encounter, as he “began to see sharks for what they really are”. He said “they’re so beautiful, they’re fantastic…they’re like big dogs…they’re just not mean”. He also had an awakening- Craig “used to think that Oprah was the most powerful being on the planet”. The show had a conservation message in the form of shark dive company Stuart Cove’s. The dive operators mention that sharks are in decline, and how they use their company to teach people about the importance of sharks and how they can help . It also featured a scientist- my friend Dr. Dean Grubbs (the FSU scientist who originally taught me about the dolphin-safe tuna issue). I cannot praise Discovery and Craig Ferguson enough for “Shark Bites”. Overall grade: A+ (the first A+ I’ve given a Shark Week premiere). 1) Include conservation pop-ups during the shows. Again, I didn’t watch the shows at their original airtime so I don’t know if these were included. Can someone please let me know? Cannot grade at present. 3) Improve the website: Eh… I suppose it’s a little better. One of the menus from the Shark Week home page is “Conservation”, which is good, but I have no screenshots of last year’s website so I can’t do a critical evaluation. I’m working from memory and I seem to recall that it was harder to find conservation information on the website last year than it is this year. No grade, not enough information. We’ve got a long way to go before the conservation community is satisfied with Shark Week, but 2010 was undeniably a big step in the right direction. Until next August, be sure to live every week like it’s Shark Week! I watched a bit of shark week, I just will not watch the shows that show only the shark attacks and their survivors. I did enjoy the Airjaws and Craig Ferguson’s show was hilarious, real and his reaction after his second shark dive was genuine and really left an impression on him. Part way through the Craig Ferguson special, I was a bit worried about how it was all going to turn out–but I really, really, really loved it and was generally warmed by his turnaround and awe of sharks. While the shark attack specials continue–many beginning with statements about how unlikely/rare shark attacks are, confoundingly–I feel that this Craig Ferguson special, the Shark Week specials by the Mythbusters and Mike Rowe, and the continuation of the Air Jaws series give me some hope for Shark Week 2011 and into the future. 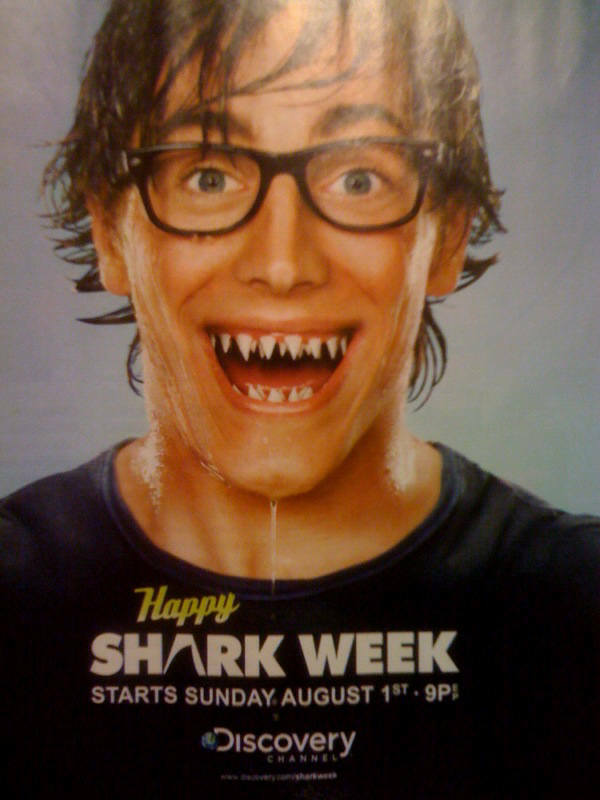 I wish I could agree with you that Shark Week has improved, but alas, I cannot. For the sake of full disclosure, I must admit that I did not watch every show and I did not watch any at its premier slot. That being said, I feel that everytime I found a tv and turned it to Discovery (as I am inclined to do Shark Week or not) I saw gnashing teeth and bloody water. Your review suggests that this year’s Shark Week was not all blood, guts, and fearmongering (and I have no reason to not trust you), however that is all I saw. Shows that show attack after attack and then end saying that sharks are the rel victim are not conservation tools. Also, naming shows with catchy, vicious-sounding names does not help the cause. I realize this attracts viewers and Discovery Channel is a business, but this should not be disguised as a conservation based approach to programming. Like most of your readers, I am extremely happy to see the public excited by sharks and hopefully growing passionate about their conservation, however, I do not think this year’s Shark Week did a great job of promoting that. I hope next year the shows are more educational and less sensational and that we can turn every week into shark week (in a positive way). Better doesn’t mean perfect. Seriously- watch the Craig Ferguson special I linked to in the article. I feel I must agree with Dovi Kacev here: after much ‘hoopla’ over the ‘new’ Shark Week, being promoted as ‘new and improved’ when it came to a conservation message–they partnered with some shark conservation groups–I was dismayed, when I turned it on to see the ‘SAME OLD Shark Week,’ with numerous close-up shots of Great White teeth, blood in the water and, of course, the obligatory REPEAT showing of the girl getting attacked in the water, as filmed by her friends on a boat above–just like last year. I give a D- to SW this year, and hope, guardedly, for DRAMATIC improvements next year, or I shall be forced to resume my annual boycott. Frankly, I am a little dismayed that shark conservation groups, such as Oceana, have been ‘touting’ their partnership with SW, given that so little has changed. Have they even watched this year’s episodes yet? The two shows I did catch – Shark Bite Beach and Ultimate Air Jaws – were more of the same sensationalist propaganda. Shark Bite Beach was a massive fail, and Air Jaws wasn’t much better. Disclaimer: Both myself and WhySharksMatter received press packages from Discovery Channel which included DVDs of two shows and t-shirts. I just watched the Craig Ferguson special, and I must say that I found amusing and quite powerful,and I hope all the viewers finished the episode with the same lesson that he did. However, the line that I found the most pertinent was near the beginning where he says, “Whatever you say about Shark Week, its the attacks that you remember” (right before the Heather Boswell segment). Despite the fact that this program has a nice tone and lesson it is surrounded by programs about gore and fear. What do you think most viewers will remeber a month down the line? I have not lost all faith in Shark Week and I will tune in next year, however I still do not feel like this year was an improvement over last. I feel like “Shark Bites” would be a good intro show for next year’s shark week if it is followed by documentaries about actual shark biology and conservation, which I believe will be more interesting to viewers than another formulaic show with attack reenactments. I hope someone takes your list of improvements to heart. I guess we will find out next year at the sames shark time on the same shark channel. Like seemingly just about everything else that would be a step in the right direction, these things take time –time sharks don’t necessarily have. But hey, at least it’s something, yes? A step in the right direction, Discovery is listening. Looking forward to the next steps. Interesting review David, although you left out the River Monsters episode which was about Bull Sharks in South African rivers. I had hoped it’d be more scientific but it wasn’t (C+/B-). That being said, I have to disagree with your analysis. As good as the episodes were, and you reviewed them quite well, it still is NOT what shark week should be about. Nor is it what it was about. Air Jaws was fun to watch from a photography and cool footage perspective, but that’s it. I lost repsect for it when they started saying I hope the shark goes for the seal and not the sled, and when they said they were trying to “see the pressure wave” right before the attack. It was a lame attempt to give the “research” more importance than just cool photography. That being said it was visually awesome! I know we will probably never again see the days when shark week used to have 7 nights in a row of legitimate science documentaries, that actually chronicle a certain research project and show some of it’s results. Oh, it would have also been nice if Shark Week was, in fact, a WHOLE WEEK. Not the 4-5 days that we had this year. New episodes only aired, Sunday (2), Monday, Tuesday, and Wednesday (Thursday if you count River Monsters shark special). I only reviewed the six premieres, those shows that were newly aired last week. That was not the case with the River Monsters episode. I did review it when it aired earlier this summer, and I think a C+ is not an appropriate grade for it (I’d say F-). I am so glad to see that someone else remembers the days of full-week documentary-style shark weeks. This is actually why I can’t agree that it’s really improved much, because it used to be everything everyone seems to be asking for and somewhere along the way they stopped doing that. I thoroughly enjoyed your review, and I will most certainly catch the Craig Ferguson special. Like most scientists, and especially those dealing with elasmobranchs, I have lost faith in Shark Week and haven’t bothered to watch it in the past several years. Ludicrous pseudo-science (if that!) and shark attacks around every corner just doesn’t sit well with me. The “Air Jaws” series was a fascinating look into the behavior of the worlds largest predatory fish the first time, but how many ways can you spin a segment about the same thing? Put the word “Ultimate” in the title, I guess. I like that you pointed out scientific inaccuracies, as I know they abound in these shows. The one that caught my attention is the quote claiming Carcharius taurus to be one of the 5 deadliest sharks. While it certainly is not the deadliest shark (far from it, and anyone who has been wreck diving off the coast of N.C. knows this), it does get a bad reputation from the high number of attacks reported by this species. Due to their slow-moving, inquisitive nature (allowing divers to literally touch them sometimes), and their tendency to hang around prominent spear-fishing spots, divers often harass and provoke them to the point of getting a nasty bite. I don’t know if this is still true, but a few years ago, the Shark Attack File could be cited showing that C. taurus ranked #4 in most attacks on humans (none were fatal!). That’s probably where the misguided quote in the show came from. I don’t know if it’s just me, but when I click on the link you posted to “Shark Bites,” it redirects me to the video for “Sharkbite Beach.” Looking around, I couldn’t find the video I was actually trying to watch. It works when I do it. If not, google the main Shark Week site, click on “videos”, and all six premieres are available online. I have to say, I agree about “Shark Bites”. During it, I was laughing, but a bit annoyed that they were showing bits from all of the most sensationalistic moments of Shark Week… but CraigyFerg’s genuine enthusiasm and wonder at these creatures after diving them was really refreshing. It reminded me of when I was a kid. Shortly after seeing “Jaws”, I had the same fear-ish excitement everyone else has. But luckily I also had a very good hand-me-down book about sharks, and by the time I got to the end of it, I was filled with respect and appreciation for sharks. I’m still very disappointed in Shark Week. If they don’t have specials that deal specifically with conservation and finning they are simply failing at their clear moral obligation. I’m unhappy with most of their programming this year… but I went into this year’s Shark Week thinking it was going to be the last one I ever watched. But they’ve kept me for another year, as long as their programming keeps moving in this direction. I honestly think that although this year’s shark week was a small improvement over last year’s, shark week has overall been going downhill over the past few years. I’ve watched every episode of every shark week for 11 years, and the shark weeks of the past were significantly better. They used to consistently advocate a more understanding and informed view of sharks (so there were never episodes about shark attacks, as opposed to this year when they re-aired the summer of the shark, which was aired last shark week as well), and never used material from previous shark weeks. Shark week used to also consistently air material about new science and discoveries pertaining to sharks. The first footage ever shown on television of the sharks jumping in South Africa was aired during a shark week (this was the first Air Jaws episode, I think there have now been 4 or 5), and one shark week they had 2 or 3 totally different (and extremely educational) episodes about megaladons after full megaladon jaws had been found and enough had been discovered, read in historical accounts (or guessed about) about these massive sharks to put together some 1 hour tv specials. The footage of Dr. Erich Ritter in one of this year’s shark attack episodes having his calf muscle torn out by a shark was first aired during a pro-shark episode about Erich Ritter and his research with bull sharks, with full explanation from him afterwards of what he thinks happened and why he doesn’t blame the sharks and will still get back in the water with them. So I guess in sum my opinion of the seeming improvement of shark week this year is that Shark Week used to be groundbreaking, filled with new discoveries, scientific research, different views of sharks from biologists and ecotours (cage divers, open water shark divers, etc), and a consistently positive pro-shark view promoting an understanding of the sharks instead of fear. Over the past several years shark week has clearly degraded into a fear-mongering collection of exhausted old-news footage about shark attacks that is entirely un-educational and has been aired too many times before. This year had a few new things to show, but it was mostly building on old shark weeks (such as yet another Air Jaws episode, though I do appreciate that they are keeping up with the new research in this), and there were alot of reruns from previous shark weeks. And it wasn’t even a whole week with 2 new episodes a night (which it used to be). I honestly think they’ve just stopped putting the effort in, to the point that what used to be the filler episodes (such as the continuation of air jaws) have become the main features of the week. So although it has improved, it’s only marginally in comparison to what it once was. Hello to SC and CharlesTown. Like a previous post, I enjoyed the SharkWeeks of the past, expecally the prehistoric episode with the archeologists looking at teeth and imaginating what the long-ago elasmobranchs looked like. If only more SW’s were like that. I have read many a report on shark finning and would love for an episode to focus on that or maybe the an episode on the different rules and regulations around the world of sharks and their management. Or a reality type show following NGO’s while they encourage passing elasmobranch regulations in Congress. My cousins (who only got into sharks because of my love for them) said that they disliked most of the episodes except the bite force (expecally the fact that all the cameras got runied) and Craig’s SharkBites. And they are totally impartial to the conservation and management, and I think that says a lot. Great review David. Its heartening to know Shark Week is getting better but the content still indicates a strong need for at least one conservation film. Im a little skeptical of the Oceana endorsement. I think I talked myself out of a job as camera for Shark bite Beach by suggesting we tell it from the shark’s point of view of man biting shark. Check out our shark fin ban and the movement going on in California. I was unable to watch all of shark week, but the episodes I did see were pretty awesome to watch, but the listening was not as awesome. At one point as a man got in a kayak to go out kayak with some great whites near the shore he is saying things like, “sharks aren’t as bad as everyone makes them out to be,” “sharks are generally docile and I have little reason to fear this encounter” but the music is generally horrible scary dun-dun dun-dun dun-dun music and the voice-over is saying things like, “he gets into the kayak to do one of the most dangerous things EVER. Will he survive?” It was kind of appauling. I did however enjoy/envy watching him go out to kayak with the great whites. Also, I did agree that it was better than last year (though not fantastic).